When we say the words ‘gentle’, ‘moisture’, and ‘soft’, the name that immediately comes to our mind is ‘Dove‘. This Go Fresh Nourishing Body Wash from the brand is enriched with unique NutriumMoistureâ„¢ technology that delivers natural nutrients to the skin while gentle cleansers in it cleanse the skin gently without stripping it of its natural moisture. The hydrating milk present in the mild formula results in a deeply nourished, softer and smoother skin. The light body wash also contains the uplifting scent of crisp cucumber and soothing green tea, which revitalizes our senses and leaves behind a fresh touch. Price: Rs. 99 for 190 ml. The Nivea Powerfruit Fresh Shower Gel is an exclusive combination of ‘Powerfruit and nourishing skin care’, which provides tempting freshness and rich care for your skin under the shower. The acai berry and blueberry extracts along with the antioxidants present in this pH-balanced product help cleanse the skin gently, rejuvenate it, and relax it during each shower. It also comes with Hydra IQ 24h+ moisture technology that leaves the skin feeling soft and moisturized even after towel drying. The delicate fragrance and the silky soft foam of the body wash not only stimulate the senses but also offer invigorating freshness throughout the day. Price: Rs. 199 for 250 ml. The Biotique Sea Kelp Shower Gel is a 100% soap-free cleanser that features an Ayurvedic recipe using all herbal ingredients. The refreshing face and body cleansing gel contains marine minerals including bio Sea Kelp, which cleanses the skin without stripping it of its natural oils and removes all microbes as well as pollutants. Being rich in seaweed, the aqua blue-colored gel formulation keeps the skin hydrated enough. The product also has a refreshing and uplifting fragrance. Price: Rs. 180 for 210 ml. The Olay Body Wash Plus Body Butter Ribbons has a deep-moisturizing formula for delivering intense moisture to the very dry skin. The thick, creamy product comprises jojoba butter and orchid extract, which nourish as well as hydrate the skin efficiently without causing stretchiness, itchiness, or breakouts. It features the aqua current science in which two intertwined ribbons- one for ‘cleansing’ and the other for ‘moisturizing’ – are used to move moisture specifically those parts of the body where it is required the most. Hence, your skin feels thoroughly moisturized after each wash and improves visibly in just 5 days. The product also comes with a beautiful, relaxing aroma. Price: Rs. 220 for 295 ml. The Neutrogena Rainbath Refreshing Shower And Bath Gel can ‘turn an ordinary shower into a pampering spa experience’ by cleansing, conditioning, and softening the skin with a rich lather that does not leave any heavy residue behind. It has a special formula that harnesses the intriguing fragrance of spices, herbs, and fruits for providing a burst of freshness. This not only refreshes your whole body but also awakens your senses. The body cleanser can be used as a shaving gel too. Price: Rs. 399 for 250 ml. The Body Shop Strawberry Shower Gel is one of the most popular products in The Body Shop shower gel range. Being enriched with real cold-pressed strawberry seed oil and community-trade honey (from Ethiopia), it nourishes and moisturizes the dry skin perfectly while helping in skin regeneration. The rich lather produced by the product makes the skin squeaky clean, envelops it with softness, and leaves it feeling silky soft. The soap-free shower gel also has a sweet fruity scent of strawberry that keeps us energized all through the day. Price: Rs. 325 for 250 ml. The Fiama Di Wills Enlivening Beads Shower Gel is a perfect combination of ‘luxurious skin nourishment’ and ‘superior bathing delight’. The exotic product comes infused with skin conditioners that lock in moisture into the skin, thereby giving you a soft, moisturized, and young-looking skin round the clock. Moreover, it comes packed with natural blackcurrant and bearberry extracts along with rich, encapsulating glitter beads that prevent water loss from the skin, cleanse all impurities, and remove dead cells gently to ensure a rejuvenating care. The shower gel also has a luscious fragrance and indulgent lather. Price: Rs. 199 for 200 ml. The Palmolive Thermal Spa Skin Renewal Shower Gel is a unique product that claims to firm up the skin and improve its softness when used regularly. It has a deliciously creamy formulation that is infused with crushed coconut and jojoba butter extracts for retaining the natural moisture of the skin and making it silky soft. It also contains seaweed extracts and thermal salts to renew and tone up the skin naturally by eliminating dead skin cells and reducing cellulite. The rich, fragrant lather of the product always gives rejuvenating baths. Price: Rs. 190 for 250 ml. Who doesn’t love the pears soap? When the same deal comes packaged in an easier to use gel form, there is nothing not to love about it! The 100% soap-free Pears Pure And Gentle Shower Gel not only cleanses the skin gently off all its impurities but also leaves it soft, smooth, and supple like that of a baby. It is enriched with pure glycerin that moisturizes the skin deeply and keeps it hydrated by locking the natural oils and moisture in it. The mild and gentle shower gel is fully pH-balanced, which ensures that you get a healthy and glowing skin after each wash. It also has a mild and soothing fragrance. Price: Rs. 180 for 250 ml. 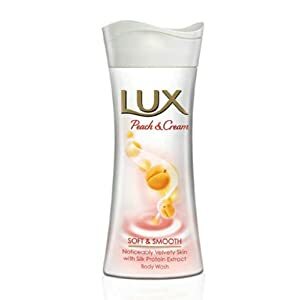 The Lux Velvel Touch Moisturizing Body Wash is the top-selling product from the Lux body wash range. The soft and creamy formulation comprises SilkEssence (silk protein extracts), peach, almond oil, and modern Floral Fusion™ Oil, which make it glide over the skin and make it noticeably velvety by cleansing and replenishing effectively. 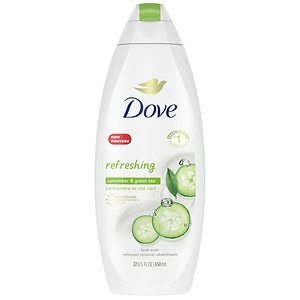 On the other hand, the distinct scent of the body wash leaves you aromatic throughout the day. Price: Rs. 70 for 100 ml.